Warm welcoming with Thai style service will embrace you here at ‘Aek-amorn Place’, an apartment that offers you cozy atmosphere where located very close to Phuket town. 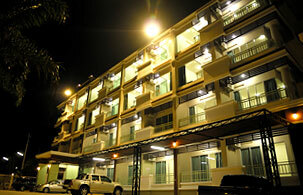 Staying here, of course, you will absorb and feel the truly Phuket. Additionally you can easily enjoy dainty local food, sightseeing Phuket old town, and shopping in many shopping centers around the island. Not only these alternatives you will get from staying here, but also, you will get many fully services from ‘Aek-amorn Place’; wireless internet, laundry service, restaurant, swimming pool, and so much more. Moreover, here offering you with 54 rooms with balcony which include 2 deluxe, 6 suites, 2 connecting rooms and 44 standard rooms for both daily and monthly rental. It’s ready for you to live in without bringing anything but yourself! No need to hesitate, ‘Eak-amorn Place’ awaits to service you. Allow yourself to have a good stay with us and allow us to take a splendid care of your stay. Service you is our first priority.